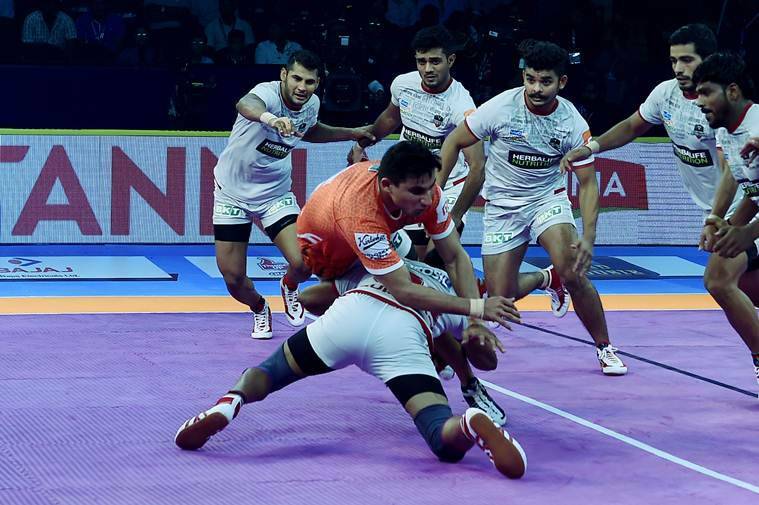 Pro Kabaddi League 2018, Haryana Steelers vs Gujarat Fortunegiants, 0Puneri Paltan vs Dabang Delhi Highlights: Haryana and Delhi emerged winners of Day 1 of Sonepat Leg. Dabang Delhi record their first win of the season by beating Puneri Paltan 41-37 in Sonepat. It was an all-round performance by Delhi that fetched them this hard-earned victory against Pune, who were heavily dependent on Nitin Tomar. Delhi scored 11 points in the last five minutes of the game as compared to five points by Pune. Delhi are cruising right now! They lead Pune by eight points. Vishal Mane with a tackle and Amit Kumar just about reaches the line but no part of his body was inside the mat! That gives a point to the Eagles. Both sides are level at 25-25 with ten minutes of the match remaining. Nitin Tomar ensures Pune goes into the half-time with a two point lead against Delhi. Two successful raids by Nitin towards the end of the half ensured an upper edge for his side. A brilliant effort from Nitin Tomar. Absolutely brilliant. He uses all his energy to ensure he reaches the mid-line. Powerful effort by the raider as he wins the 11th raid point of the night. Second match of the day between Puneri Paltan and Dabang Delhi underway in Sonepat. Puneri Paltan get the opening points of the match with some good defending but the Dabangs make their way back by winning the next three points. Monu is denied a point in the do-or-die raid. Gujarat Fortunegiants coach giving intense and serious instructions to the side, who still have a scope of turning the match in their favour. He is giving them clear instruction of picking points within 10seconds of raid. Sunil does brilliantly to claw at the opponent's feet. Later, Mayur Shivtarkar was inches away from a splendid raid but Haryana kept their defense tight. Haryana lead by four points. Prapanjan with back-to-back raids has helped Gujarat get close to the hosts. What is of concern here is that he is bleeding. You can see blood even through the bandage but he is still playing an active role in the match. To the delight of the home stadium, Monu Goyat wins Haryana another raid point. Gujarat have bridged the gap between the two sides to four points. Haryana lead 21-17. Monu Goyat's side makes the most of the home support as Haryana leads Gujarat 20-13 at half-time in Sonepat. A seven point lead at half-time is not at all bad. Kuldeep Singh has been solid from the back and Naveen has done brilliantly with 4 raid points. Brilliant captaincy by Monu Goyat as visitors Gujarat are left all-out. Gujarat need to start all over if they want to avoid going down and turn the match in their favour. Haryana Steeelers won the toss and have chosen the court against Gujarat Fortunegiants. Brilliant beginning from the hosts after Yogeshwar sings the national anthem. Monu Goyat doesn't disappoint as he returns with a touch point with Haryana Steelers taking 5-0 lead at the start. Look who’s here to support the #DhaakadBoys? Hello and welcome to our live coverage of Pro Kabaddi 2018. The second leg of the season kickstarts today in Sonepat with the home side Haryana Steelers taking on Gujarat Fortunegiants in hope of their first victory. Stay tuned for live score and updates. Pro Kabaddi 2018 Live Score, Haryana Steelers vs Gujarat Fortunegiants Live Score Streaming Online: Haryana Steelers made it to the Super Playoffs in their debut campaign but lost out to eventual champions Patna Pirates in Eliminator 2. The side, which is hoping for their first win of the season, boasts of raiding trio of Monu Goyat, Wazir Singh and Vikash Khandola. Haryana Steelers will be hoping that their offence, along with their defence that includes young Kuldeep Singh, Vikash and veteran Sachin Shingade will bring the title home.